Modernising our homes is often on our list of things to do. So, why not kick-off your home revamp with a modern kitchen? A streamlined, modern kitchen design, complemented by cutting-edge appliances, cool lighting and a variety of surface levels helps to keep your room free of clutter — giving you all the room you want to unwind, cook, dine, and enjoy company. The kitchen is where we bake, prep and entertain, so it needs to be filled with everything we need to do this to our best ability! Choosing appliances is a huge part of decorating modern kitchens. If you like those big range cookers, choose one of the more modern steel models from Smeg, Mercury or Rangemaster. Place items such as washing machines and tumble dryers in utility rooms and ensure your fridge and freezer are stored behind closed doors. Try and keep sightlines clear by installing below-cabinet, in-ceiling or pop-up extractors, too. Invest in built-in cooking appliances and finish off the job with extras such as a boiling water tap, pop-up power points and cool lighting fixtures for a faultless contemporary kitchen. Quality, eye-catching worktops are essential when you’re styling a modern kitchen. From bright white to bold orange, there are lots of options. Plus, many manufacturers, including Silestone and Caesarstone, are now producing man-made composites that replicate natural materials. Of course, while they look just like marble or concrete, the real benefit of these surfaces is that they are much easier to look after than natural stones, particularly very porous ones such as marble. Faux marble is also fantastic for creating protective splashbacks with less of the expense than real marble, too. Today, there’s a huge range of modern kitchen composite worktops in various colours and patterns that give you an easy way to create a modern kitchen. Sharp and sleek lines are the hallmark to the modern kitchen. In smaller kitchen spaces, the absence of handles conveniently makes the room look bigger. But in a kitchen with lots of cabinetry, it also prevents an overload of attachments that stick out and get in the way. Add cool built-in appliances and top with colourful composite worktops to really make a statement in your kitchen. From fashion to home décor, opting for less tends to work best for giving a trendy, up-to-date appearance. And your modern kitchen design is no exception. The first step to a contemporary space is keeping as many items as possible out of view — even though we all like to show off our cool KitchenAid mixers and other appliances. Hiding clutter in open kitchens is vital, so bear in mind storage space and include deep pan drawers and tambour units to keep small appliances and crockery out of sight. Don’t forget, your kitchen need to work efficiently, too. So, put pan drawers by ovens, larders close to preparation areas, and crockery close to the dishwasher. Floor-to-ceiling cupboards with no handles can hide many untidy sins and are a good investment (if you have the space). Line your wall cabinets with LED strips for an instant contemporary aesthetic to your kitchen. 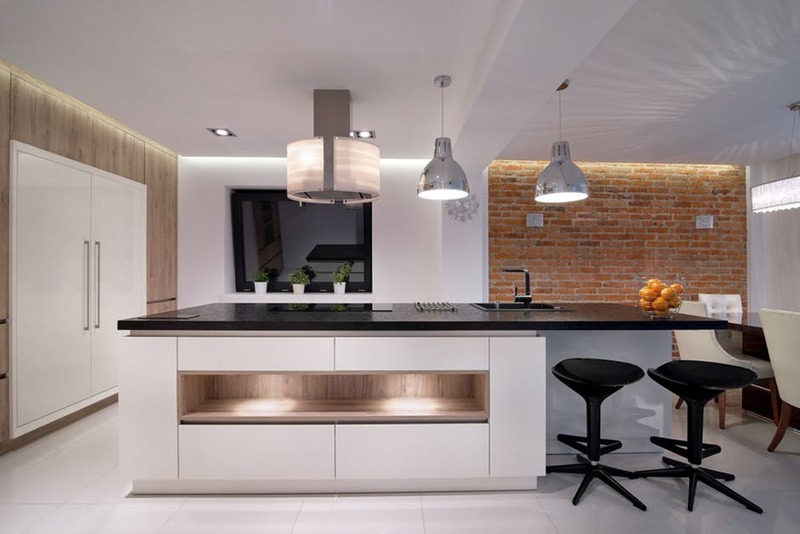 Then, implement other simple lighting techniques — such as plinth lights on your units — to create a modern kitchen as soon as you switch the lights on. Glass or composite make amazing splashback materials. Go for either, and complement the feature with oversized floor tiles secured by a matching grout and you get a true minimalist modern that really stands out. Tinkering the levels of different surfaces is a revolutionary tactic used by interior designers when they want to create an iconic, modern kitchen. You can create several levels on a peninsula with a raised area, or even place a high breakfast bar and few stools next to a lower-lying island for the same effect. Very thin worktops transform your units into furniture rather than just a utility piece. Wrap a composite work surface in a contrasting colour, or place material around the cabinets on your kitchen islands for an unmistakeable modern look.